The Alexanders: Happy 3 Months Old Bailey Mae! Happy 3 Months Old Bailey Mae! Today Bailey Mae is 3 months old! What a short time she has been in our lives, yet we cannot imagine it without her. What did I do before I had two little ones around me all the time? What did I do before nursing and wiping a bottom at the same time? What did I do before taking Avery to her activities with spit up on my shoulder? How did I function without two sweet girls in my life instead of just one? 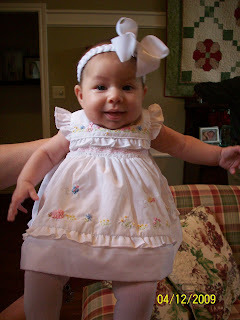 How did I live without the smiles of a chunky-cheeked little sweetheart grinning at me from ear to ear? How did I live without this darling little Bailey in my life 24/7? What did I do before I had to check between all the thigh rolls when I changed a diaper? Oh how I love this new little girl in my life!!! What a blessing it is to have not only one wonderful daughter, but two. God has blessed us immensely and we cannot thank him enough for it! Bailey Mae, I hope you feel the love your Mommy and Daddy have for you. Oh yes, and Avery, too. Such a cute picture! Hope you are enjoying your time with family!